In a just a few short hours, the pre-event MWC 2016 day brought three water-resistant flagships, the Samsung Galaxy S6, the Samsung Galaxy S7 edge, and the HP Elite x3. Given that resistance against the elements seems to be making a comeback this year, we've decided that it's time to look at the current situation of the smartphone market and analyze which are the best water-resistant flagship smartphones. Although phones that can live for certain amounts of time underwater are usually referred to as waterproof, the reality is that the correct term is water-resistant. A waterproof device would never suffer damage from water, while all of the handsets we're about to discuss are limited when it comes to the time and the depth of their water submersion. Another aspect that you should bear in mind is that some phones which do not boost IP certificates have been demonstrated to offer certain degrees of water resistance. However, there's no guarantee that water splashes or full water dunks will not damage these devices. In other words, if you want to be absolutely sure that you won't irremediably damage your device, please check the IP rating of the handset before taking it for a selfie session in the pool. We'll start off this list with what's probably the hottest smartphone of the day, the Samsung Galaxy S7. Samsung's current-generation flagship is IP68 certified, a certificate that guarantees that the phone is dust proof and water resistant when submerged at up to 1.5m for 30 minutes. 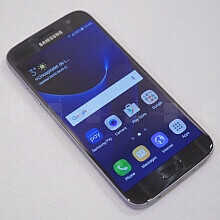 The normal-sized Galaxy S7 features a 5.1 always-on Super AMOLED display with a resolution of 1440 by 2560 pixels, a Qualcomm Snapdragon 820 chipset (in the US), 4GB of RAM, 32GB of expandable internal storage, a 12MP primary camera, a 5MP secondary shooter on the front, and a 3000mAh battery. For a closer look at the new Samsung flagships, make sure to read our Samsung Galaxy S7 hands-on. Like its smaller brother, the Samsung Galaxy S7 edge comes with an IP68-certified body, meaning that it safe to submerge the device in 1.5m of water for up to 30 minutes. Unlike last year, when the Galaxy S6 and the Galaxy S6 edge featured the same display size and the exact same internal hardware, this year the situation is a bit different. Yes, the Samsung Galaxy S7 and the Galaxy S7 edge are still highly similar, featuring the same chip, RAM, and cameras, but the display size was boosted to 5.5-inches across the diagonal, while the battery capacity was raised to 3600mAh. For a closer look at the larger of the two Galaxy S7 brothers, make sure to check out our Samsung Galaxy S7 edge hands-on piece. All of the phones in the Sony Xperia Z series boosted water resistance, and the current-generation Sony Xperia Z5 makes no exception to the rule. Just like the Galaxy S7 and the S7 edge, the Xperia Z5 is IP68-certified (1.5m - 30 minutes). In terms of hardware, the Sony Xperia Z5 boasts a 5.2-inch display with a resolution of 1080 by 1920 pixels, a previous-gen Qualcomm Snapdragon 810 chipset, 3GB of RAM, 32GB of expandable internal storage, a 23MP primary camera paired with a 5MP secondary shooter on the front, and a 2900mAh battery. A much closer look at the handset can be found by heading over to the Sony Xperia Z5 review. Many might not be aware of this, but the Moto X Pure Edition - a handset that's known as the Moto X Style outside of the US - comes with limited water resistance. The Moto X Pure Edition is IP52-certified, meaning that it can only survive short water splashes, but not a full swim. In case you need a refresher, the Moto X Pure Edition comes with specs that include a 5.7-inch display with a resolution of 1440 by 2560 pixels, a Qualcomm Snapdragon 808 chip, 3GB of RAM, 16/32/64GB of expandable internal storage, a 21MP primary shooter, a 5MP selfie sensor on the front, as well as a 3000mAh battery. For more details on Motorola's current-gen flagship, check out our full Motorola Moto X Pure review. If you're looking for a high-end Windows 10 Mobile smartphone that can survive a short swim, then the HP Elite x3 is the phone you should be looking out for. The HP Elite x3 features IP67-certified water resistance, which means that you can safely submerge the handset in 1 meter of water for up to 30 minutes. With the Elite x3, HP pulled all the stops. In terms of hardware, the handset integrates only the best hardware components currently available on the market. These include a large 6-inch display with a resolution of 1440 by 2560 pixels, a Qualcomm Snapdragon 820 chip with a quad-core CPU, 4GB of RAM, 64GB of expandable internal storage, a 16MP primary camera, an 8MP selfie shooter on the front, USB Type-C, a fingerprint sensor, and an iris scanner. You can learn more about HP's enterprise-oriented smartphone by heading over to our HP Elite x3 hands-on. Z 5 series are all water proof. Why not put all of them whereas you put s7 and s7 edge. Just saying PA. I'm not surprise though. Lol this site used to be good back in the day.. how about u wait till the phone actually comes out before you put both on the list oh I forgot PA had a 5min hands on with the s7 and s7 edge sure they got a thorough impression in that time. it is saying all of the xperia Z series,..
Z series not Z 5. Maybe you should have read as well top 5. How can you include the s7 and s7 edge in both category whereas it is in s7 series. Might as wll put another OEM. Are you really that offended? I'm not asking that that facetiously, I'm genuinely curious. Not offended though. Most of the article here are all to highlight Sammy and Fruity. You missed the part where it says TOP. But nothing new, Sony fans cry about everything, like literally everything. this article created because Galaxy S7 anyway. they don't even care about #2 - #5. I have no intentions of buying a Windows phone again anytime soon for various reasons, but damn did HP put every conceivable feature into their standard bearer. The absolute best way to make a comeback. Credit where it is due, windows mobile fans have one hell of a phone to look forward to. Hope you all enjoy it. The HP has everything I want for my next phone but I'm not going back to Windows phones anytime soon.